We are absolutely positive that we wrote about our July antics, but we can’t find that post anywhere. Well. As we’ve finished the first week of August, we don’t seem to be able to remember much about its beginnings, never mind what we did throughout July! But as members of the Clan Diehard, we’ll surge ahead and put paw to paper. We of course ensured that we got all our morning walks, even if some of them were in the afternoon! 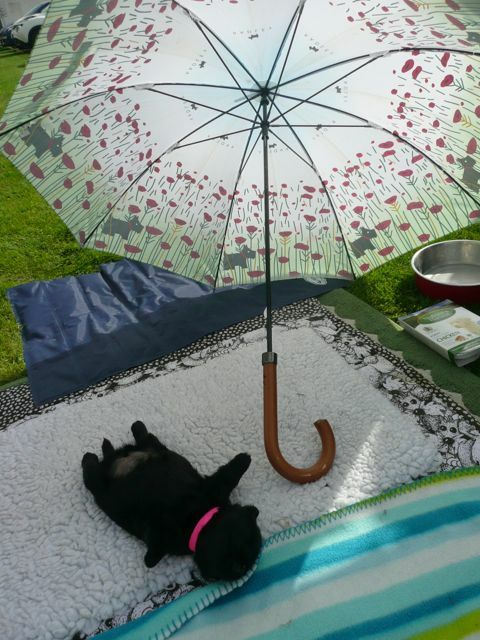 Mum said it was because some days the weather was just too warm to go out earlier. We also got wet a few times as well, but having nice thick coats we were ok! 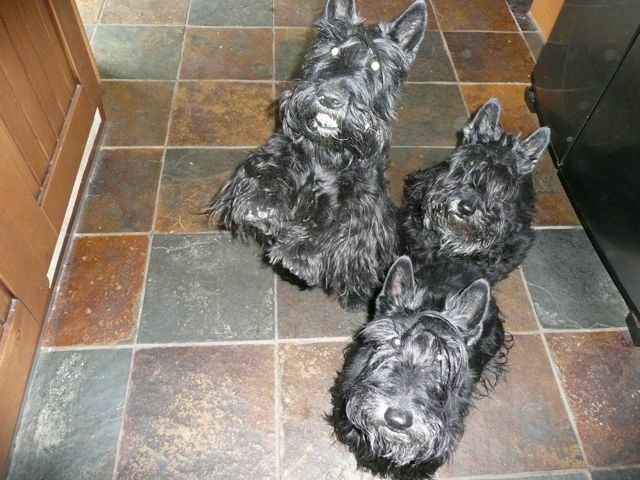 We had two legged visitors from Stirling, Scotland during one of the weekends. 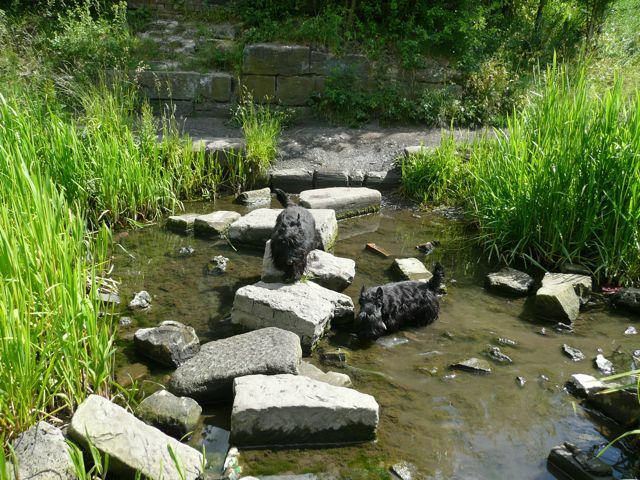 We took them out on one of our lovely walks around Belper. Looked like rain that day, but we were all surprised by really nice weather. Took us longer than normal (humans do chat somewhat don’t they, and also ‘cos it got warmer). 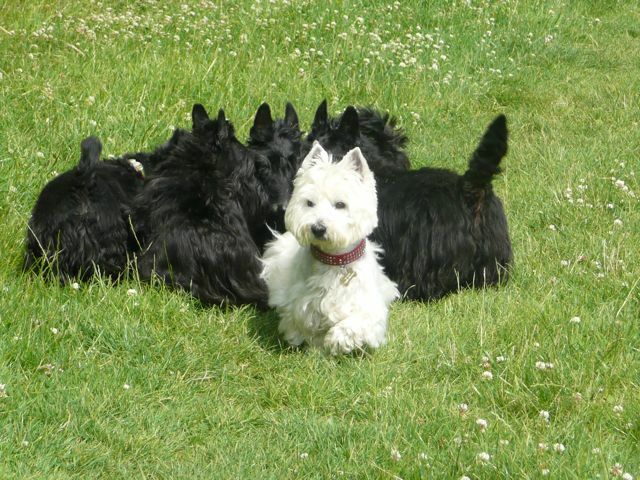 You may have seen from our sister blog Scottie Dog News, that we had a July Clan Gathering: meeting up with our brother William and our niece Poppy. That is such good fun, noisy, but fun. Mum’s still trying to photograph the Jays that reside in our woods. They are crafty creatures. They seem to know when Mum has only got her iPhone and not proper camera – they taunt her by flying lower than normal! The Woodpecker seems to have found a mate, so we are pleased for Mum. She does stand around rather too long sometimes. Doesn’t she realise that we have peemail to read and write! The woods are getting noticeably quieter. The other day there was not a bird sound at all – rather spooky. Mum thought we’d walked through one of them invisible doors Phillip Pullman writes about, and ended up in a parallel universe without birds! Even if we had, we managed to find another doorway back to our own universe ‘cos as soon as we got out of the woods, the birds on the heathland were still there. Well, as the summer slowly progresses with the advent of August, we’ll sign off and hope to remember to write About August in a timely fashion. We’re off camping in our motorhome in a couple of weeks, so there might be some interesting stuff to report on! The kitchen assistants could be us. Kendra always sits up like that, Bella gets in front and I, Daisy wait at the back! That Clan get together looks like fun. We love to play with other dogs. Luckily, we sometimes find dogs who are allowed to play with us on our walks…..while SHE watches the birds. You sound just like us boys, except that you are girls, and your Mum sounds just like our Mum, and boy are we glad She’s a girl. It looks like they both like watching the birds. Gus is the one doing the “bunny” as we say. He’s always anxious to let Mum know that ANYTIME is time for food! Enjoy your walks, and playtime with others. We have to be a bit careful as Bobby can get a bit upperty!